Thrilled to see the new issue of Knitscene, Accessories 2013, with two of my designs in it! One is a cowl in four colors called Frequency Cowl. Most of the patterns in this section of the issue have names that relate to electricity. I imagine the editors having a great time with new and interesting naming ideas. Even the properties of electricity! Not only is Frequency in the magazine, but it is also featured on the table of contents with a fantastic photograph. So honored! 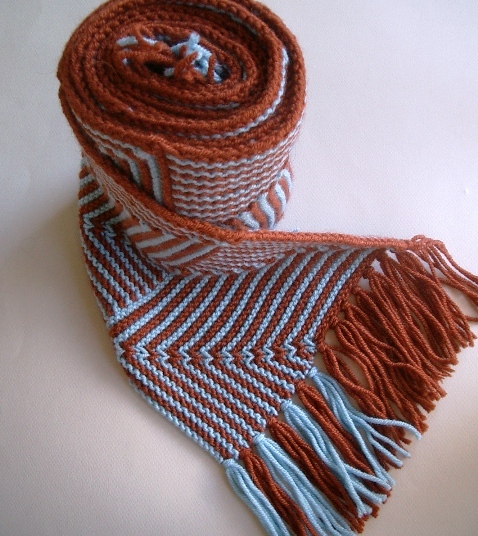 The other is a scarf called Zed Scarf. Zed uses two colors of DK yarn. It is long and cushy and has fringe. Asymmetrical fringe. Both of these designs use modular knitting. You knit a small piece, like a square or a rectangle. Then you knit a second piece on to the edge of the first piece. And so forth, adding modules until you have a full project. It is a fun way to knit. How can it ever be boring when all you have to do is this little piece now? There’s a post here on making the edges of your Zed Scarf even and beautiful. We all want even and beautiful every time. Interweave did an amazing job with the styling of these two designs! Their photography is superb. I hope you’ll take a look at their work by clicking on the links above and here. 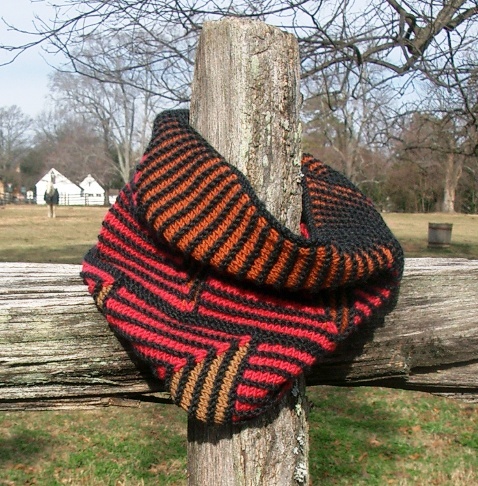 This entry was posted in knitting, pattern and tagged colorwork, Frequency Cowl, Knitscene, modular, Zed Scarf. Bookmark the permalink. 4 Responses to Two new patterns in Knitscene Accessories!! both of your patterns seem to have that nice match of challenge and beauty. i’ve got to try that cowl!! Thank you! Both are easier than they look. Modular knitting offers us so many ways to mix up colors and textures. Look forward to seeing your color choices! Thanks, Susan! I’ll send you a message directly.